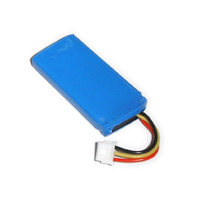 Rechargeable lithium-ion battery soft pack for bluetooth, MP3, mobile phone with protection circuit module inside to prevent over-charge, over-discharge, and over-current. Short circuit: no fire, no explosion, but damaged. Overcharge to 4.8V: no fire, no explosion, but damaged. First digit after EDC indicates the number of cells in serial. So, B (1011) indicates PTC, NTC, and Connector are selected. Similarly, 9 (1001) indicates PTC and Connector are selected. Lithium-Ion (Li-ion), lithium-polymer, and lithium iron phosphate batterypacks.